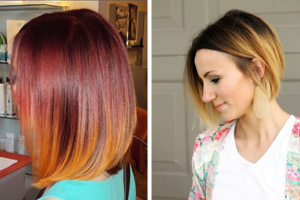 Unexpected blonde balayage-ombre adds citrussy zest to this crisp, orange rock-chick cut! 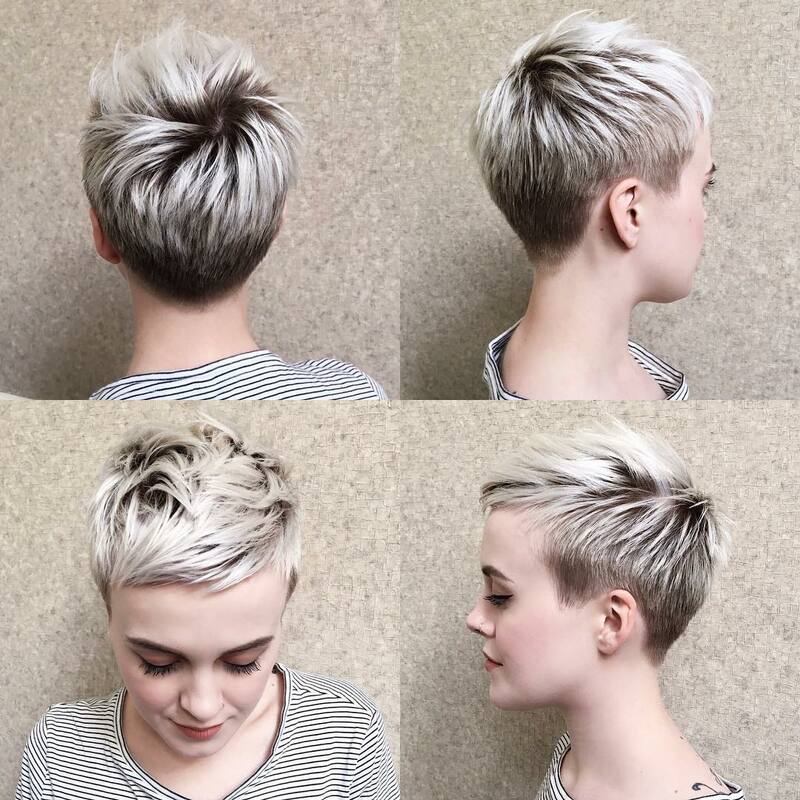 The layered pixie is a great look to get the best out of fine hair and a real wash and wear cut for active fashion-fans. This style radiates from the crown in the latest combed-forward movement, with smooth short sides and back. Short side-points and bare ears, provide a super spot to display fashionable earrings. And my favorite part is the ultra-textured faux-hawk top, highlighted in a snazzy blonde shade for a really fresh look! By contrast, this is a more conservative short haircut with a softness that echoes the gentle curves of the young model’s profile. This style suits medium-thick hair with a little natural volume or wave, making it easy to get attractive rippled texture around the head. The profile view displays the lovely natural volume around the crown, which tapers gently in to hug the nape. The side-points are feathered at the tips and soften the line by spreading half-way over the ear. 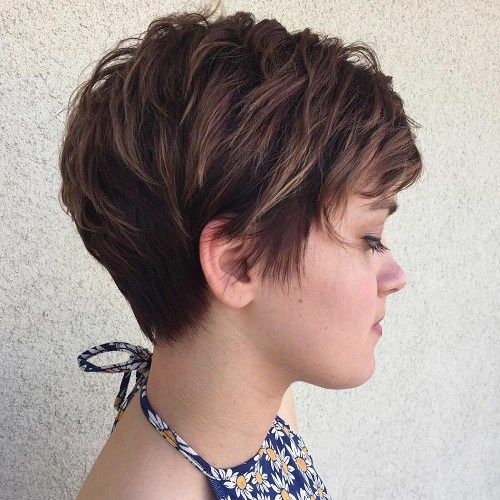 Altogether a pretty and natural brunette pixie cut, lightly highlighted with fine touches of blonde! The stylist has given this young model an ultra-modern, pixie hairstyle with shaved sides and back. 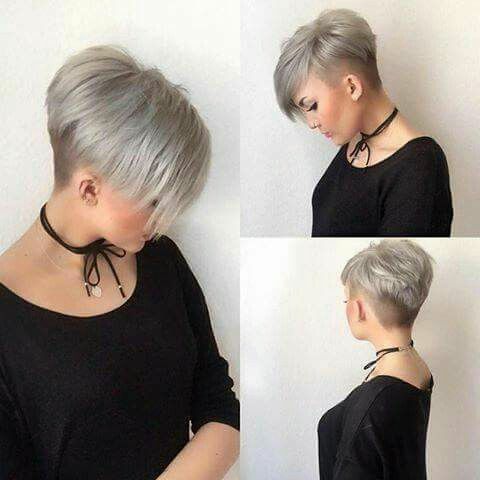 This urban-chic hairdo, has a fabulously fresh, V-shaped back in silver-gray-blonde, against the black close-cut nape. Side-partings and long side-swept bangs add fashionable asymmetry and remain one of our favorite fringe styles. 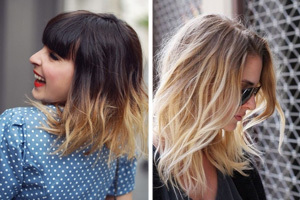 And finally, what do you think about the gorgeous, mid-ash-blonde color? It’s soooo smart and has a tiny hint of purple and green toner on the right side, too! Here’s one the absolutely latest radical hair color combinations! 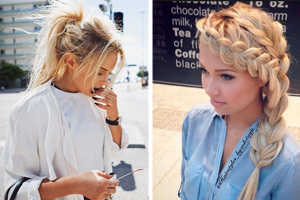 It shows how to wear ash-blonde to complement a medium skin shade, with a warm undertone. This model probably has a summer tan, but if you follow the basic hair color rules, your new color will match your winter and summer complexion. The cut suits medium and fine-textured hair. On fine straight hair, which seems to insist on lying silky, smooth and flat – you can add tons of trendy style with a modern beige color makeover! And flattering, warm gray balayage in the bangs really accentuates eye-color! 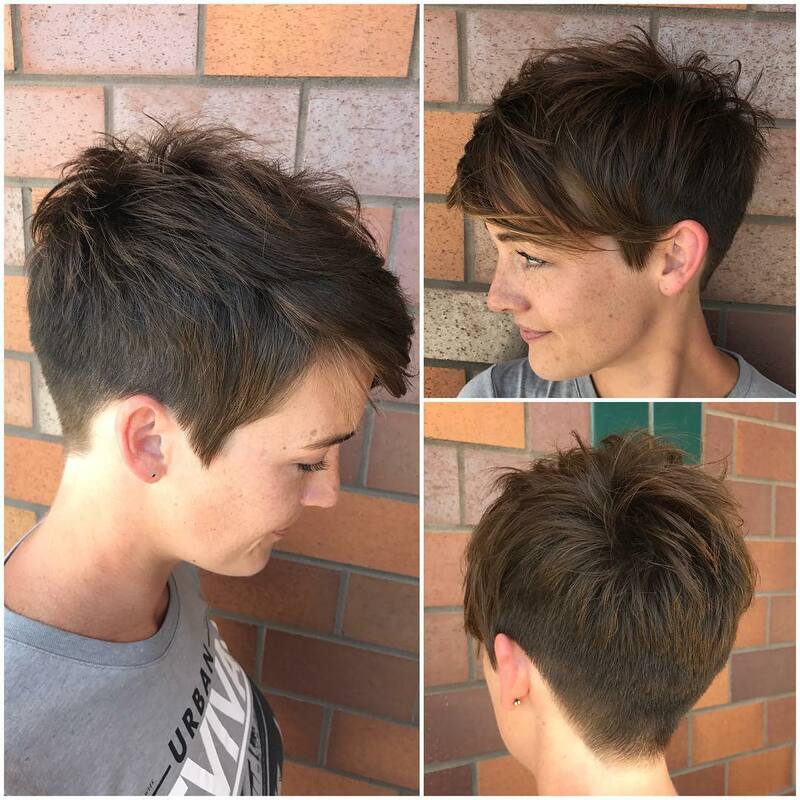 Fine hair looks lovely in a layered pixie-cut and to add interest, apply styling product to create defined strands and crown height. 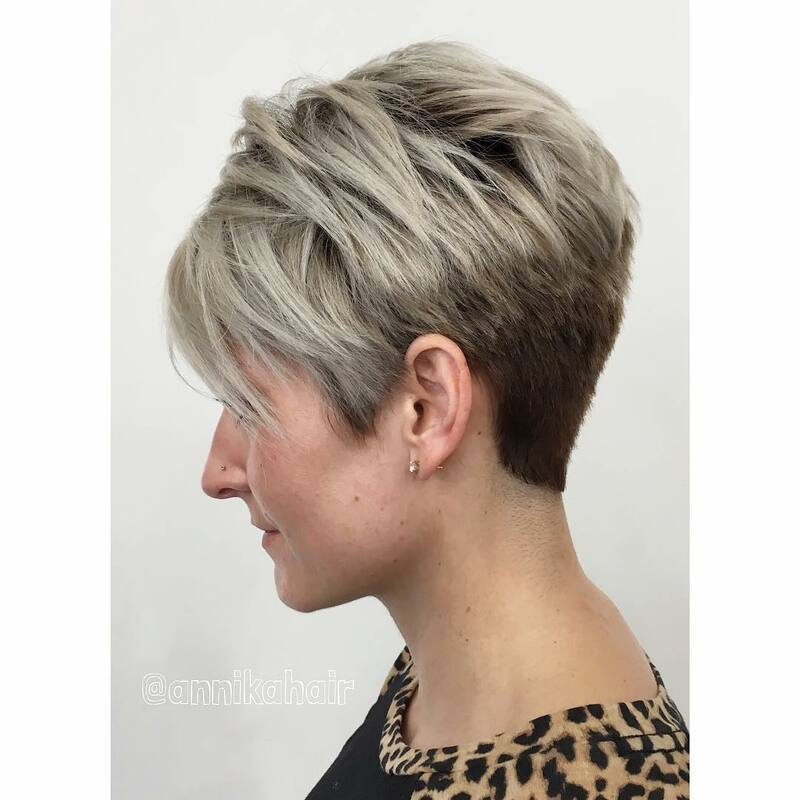 This dainty, asymmetric cut features an undercut side and close-clipped back, tinted in a very pale shade of beige-blonde. 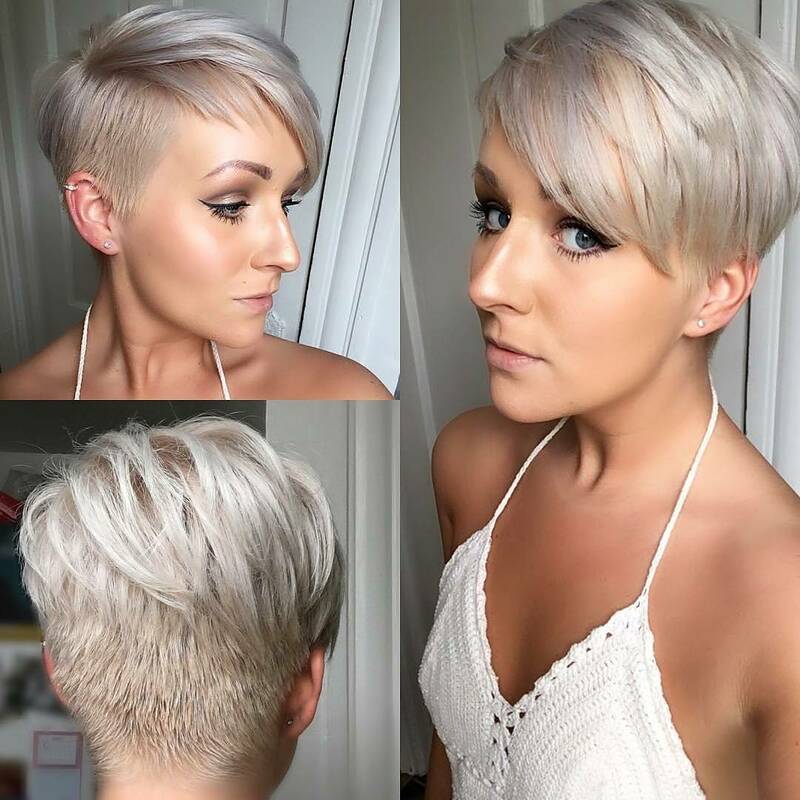 The ash-blonde top has a silvery look and has a hint of lavender toner to finish the look. The long bangs lying over the outer corner of one eye, accentuate this model’s delicate bone structure and lovely blue eyes! 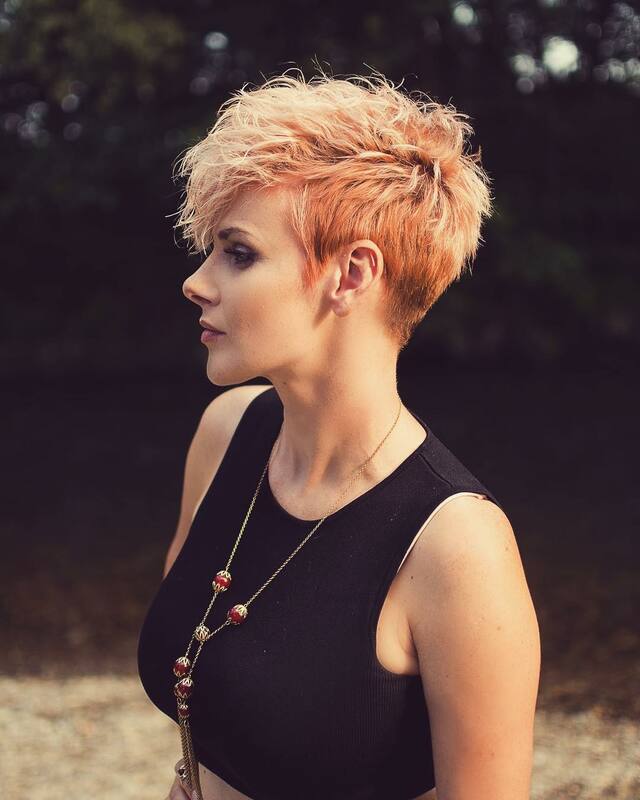 This high-fashion, no-nonsense short pixie haircut projects a confident and style conscious image! The colorist retained the dark color of the roots and close-clipped sides and back, adding an ash-blonde color band in-between. This makes an amazing 3-D effect and gives the illusion of thicker hair. 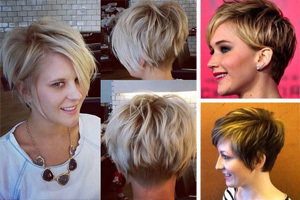 This short, bowl-cut suits medium or fine hair types that need layering to create interesting movement and texture. The short side-swept bangs can also be styled forwards in a straight-across fringe, and up in a gelled Tin-Tin quiff to vary the look! 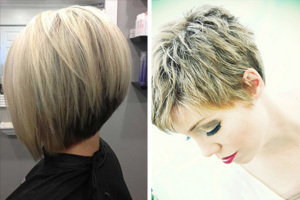 Freshen up your short haircut with a new, trendy color makeover! If you’ve been dithering about the best new color to go for over the last 2 or 3 years, I’m not at all surprised. Rose-gold was such a popular color and no-one wanted to change! The futuristic ash-colors kept popping up on fashion runways, and Kelly Osborne, but needed time to reach a wider clientele. Well, I can tell you that beige, gray and ash-blondes are clients’ most requested color makeovers right now. And they’ll be a top trend for a good while to come! 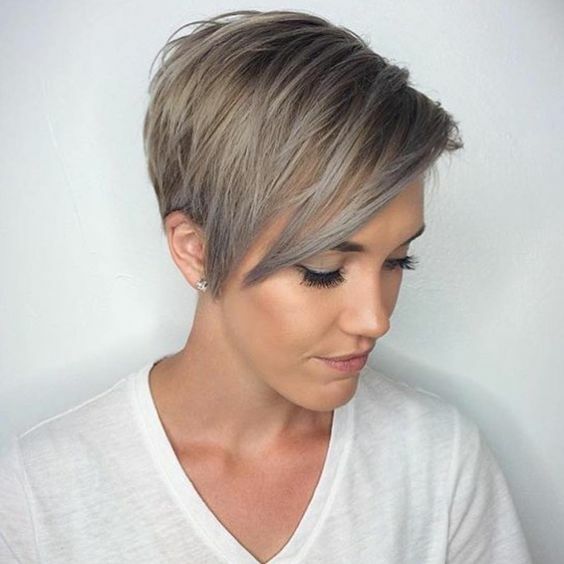 This mid-ash-blonde color suits medium skin with a warm undertone. 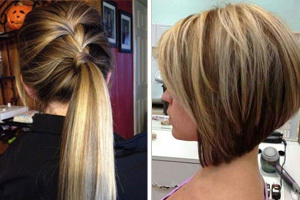 There is always an air of mischief surrounding short pixie cuts in the wearer’s natural color, isn’t there? I think we subconsciously link cute, boy-cuts with story-books about naughty school-boys and cheeky pixies from long ago! And another strange effect is that girls who wear trendy boy-cuts, often look younger and more feminine, too! Don’t you think this attractive image comes through really well from the young model above? It’s a lovely haircut that’s easy-care, face-flattering and fashionable and what more could you wish for! 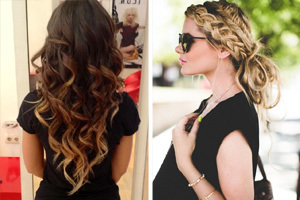 Here’s another new idea to inspire your next trip to the salon! The stylist has cut sliced layers with tapering tips to create a vertical movement on the model’s fine hair. Stylists usually use ‘sliced’ cutting to shape thick hair, so this is a new twist. But looking at the defined strands with silver and gold balayage, I’m sure you’ll agree the stylist has created a great new look! 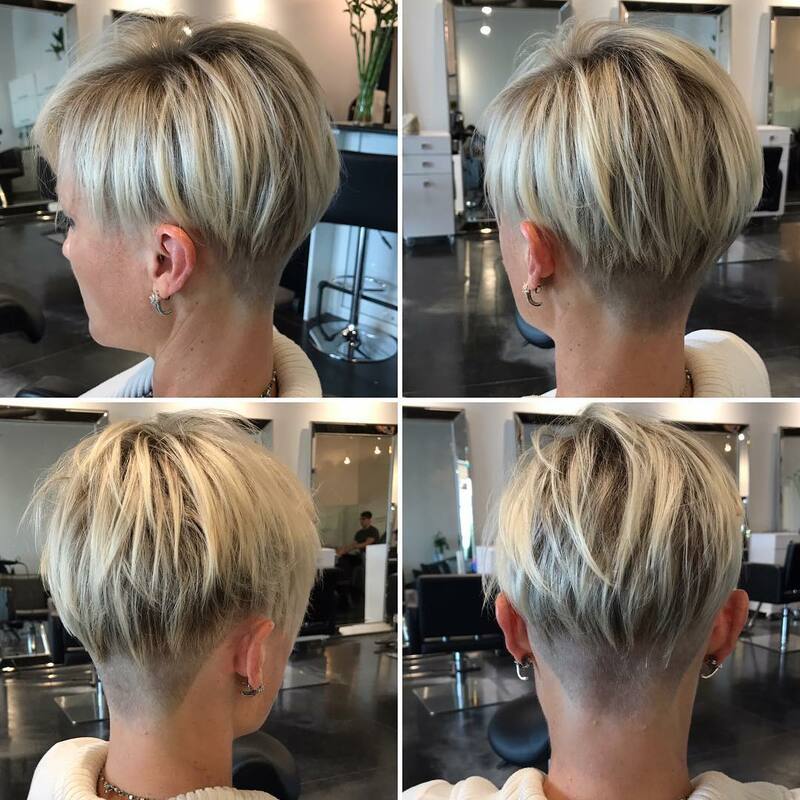 This exciting, new pixie has dark roots, a band of dark hair under the blonde and a short-clipped nape. So it’s full of different textures and colors – which is exactly what you need on fine hair cuts! 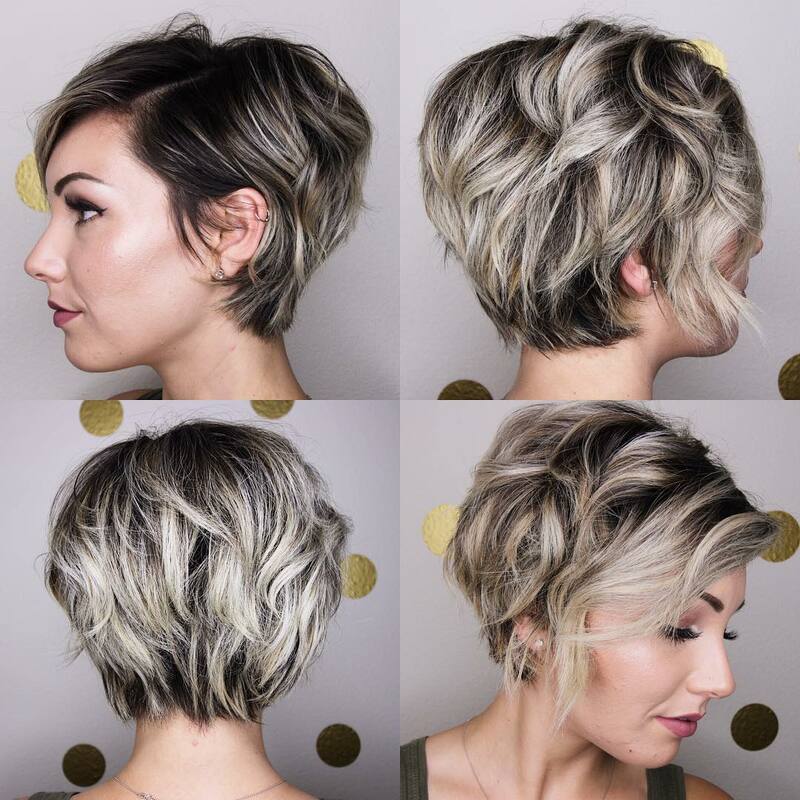 Whether you call it a long pixie cut or a short bob hairstyle, I’m sure you’ll agree this is a fabulous new color option! At first there were only pix of ice-white, ash-blonde shades, which are for cool-toned skins only. But now that ash-blonde is the major trend, you can see how the switch to beige/ash balayage can transform a brunette haircut in a subtler way. This high-fashion, two-tone style is perfect for everyday wear and equally suitable as a chic, modern look for social events!